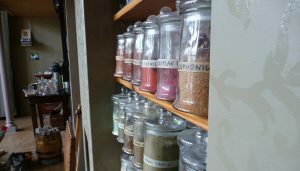 In the seventeenth century studio practice, artists bought their raw materials, such as different types of powder pigments at the local pharmacies. Only the amount of oil paint necessary for each day’s painting production would be made in the morning by grinding the pigments in linseed oil. In the larger studios this labor-intesive task was usually performed by assistants or young pupils. Before the invention of lockable metal tubes in the eighteenth century, larger amounts of oil paint could be preserved and stored for a somewhat longer time by filling and subsequently knotting up a swine bladder. However, the quality of the mass produced pre-fab oil paint in tubes which we are used to nowadays is of an inferior quality because of some added substances, such as cheap fillers to reduce the production costs (read: increase the profit) and drying retarding additives to extend the shell life of the product. It will be clear that by doing this the properties of the oil paint are altered as well, which will not only effect the working process, but also the quality of the painting itself. That is why in the Conterfeyter studio the decision has been made to practically grind all oil paint manually using only the finest quality of powder pigments. 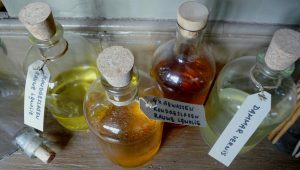 The same kind of worries we have in the case of using different diluents, such as turpentine oil, varnishes made from natural resins and different types of oils. Also in the case of linseed oil, the mass produced version is of an inferior quality to the painting oil which was used in the seventeenth century studios. Painters like Rembrandt obtained their cold pressed linseed oil (in)directly from millers specialised in this product. Because every painter had (and still has!) specific preferences how the oil should behave in practice, different types of filtering and refinement would follow subsequently. Many of these original recipes are still available, thanks to the writings of for instance Théodore Turquet de Mayerne (1573-1655). The actual grinding of the powder pigments is performed on a flat marble plate surface using a stone or glass muller. In this situation the preparation of lead-tin yellow is demonstrated. 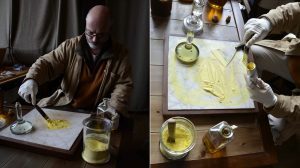 By adding the right amount of cold pressed raw linseed oil and carefully grinding the powder pigment to such an extent that all pigment particles will be tightly surrounded by the right quantity of oil, a thick paste will subsequently be produced. To allow the swine to keep its bladder for himself, we are filling up the backside of unused tubes from the pharmacy wholesale.